From Kern Burrough, received in december 2018 with the picture: "My sailing partner and myself found this old Humphreys half tonner based on the Trapper 950 languishing in a shed at the back of Deacons old boatyard in Hamble back around 1991/2. We bought her, completely stripped, restored, rebuilt her and did countless JOG, Solent inshore and RORC races thereafter.. She was quite civilised below with loo, cooker, engine under the fixed table and close to unbeatable in light airs but a bit of a handful in a blow. 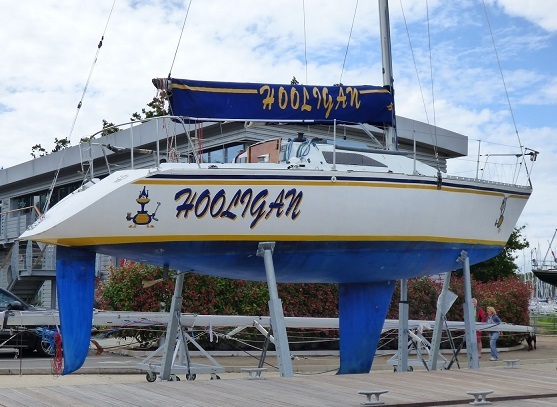 She had the classic fractional twin spreader rig with runners and we managed to keep the rig in the boat all bar one cross channel race when we lost it due to a forestay failure... Hooligan was our name, she was originally Zephyros"
2005 This is a Trapper 950 which has been acquired by Richard Frost and Stephen Stokey. It is a lightweight kevlar/foam version and although not much is known about its history it is thought that it was probably a special built by Trapper for the 1981 Half Ton Worlds. Apart from the straight spreader rig with checkstays and jumpers it looks externally very similar to 'Troy' and is clearly the same basic boat. There's no mistaking though that this is a beautiful looking boat. 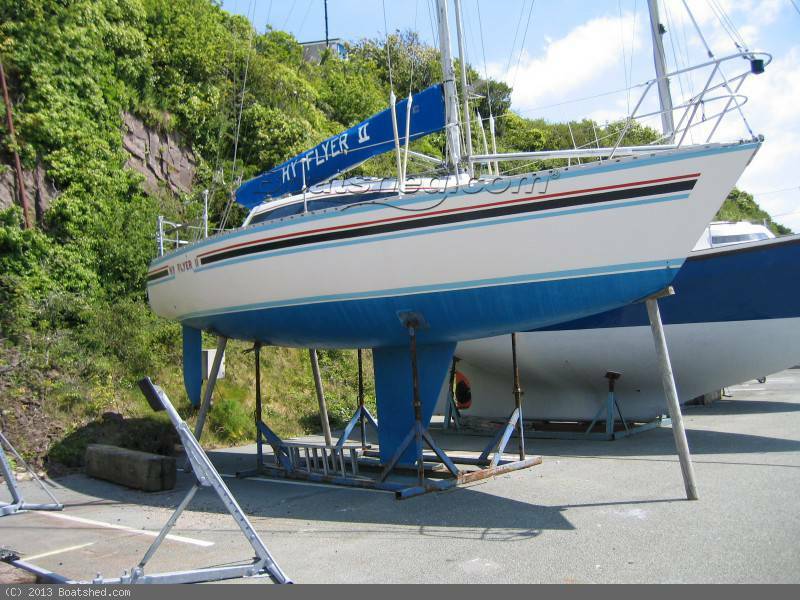 She sails from Weymouth sailing club and we'd be surprised if racing success does not amass considerably as her new owners gain experience with her. Garmin Hamble Winter Series: ?e/?? 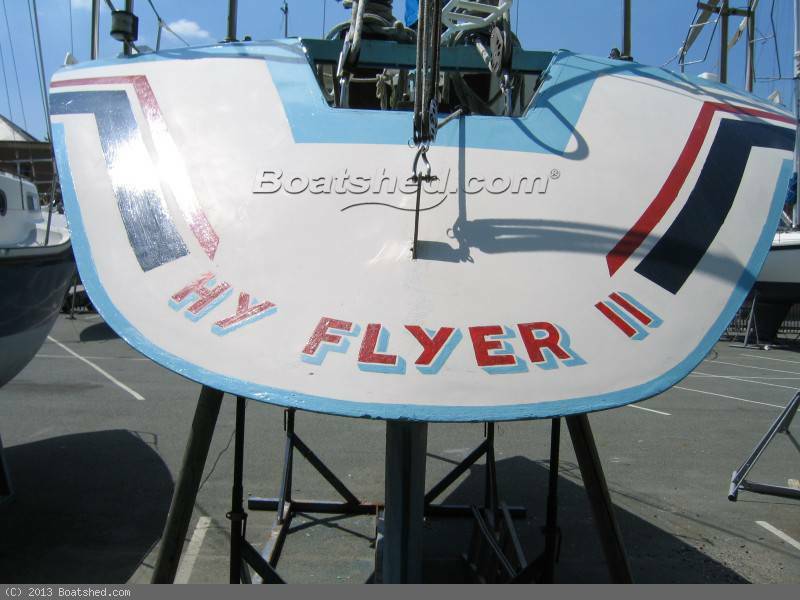 HY FLYER II, GBR ? 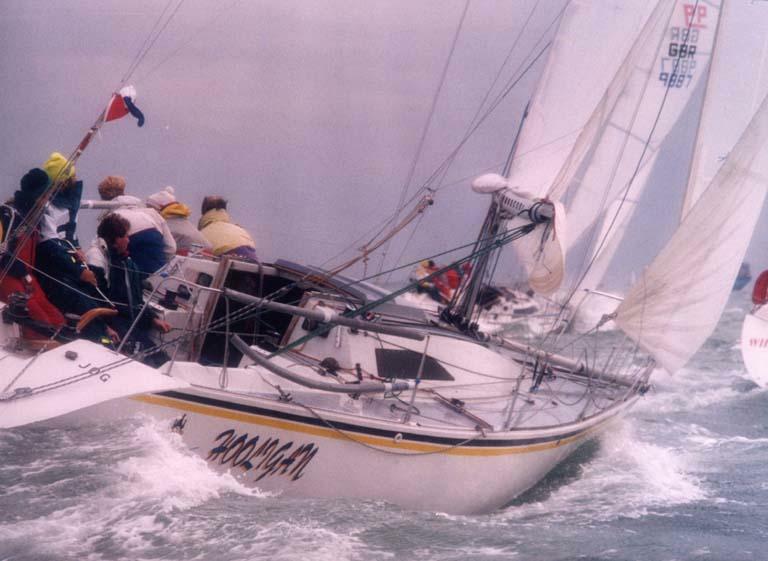 Sloop grée Holt Allen Aluminium espars (1990), avec gréement monotoron gréement dormant (1990), Launched 1983 from hull moulds of Roller Coaster, Rob Humphreys half ton cup champion.Successful racing career in Solent and Kent, won Swanick cup at Cowes. Came to Milfrod 1990 and has seen success in club races locally, as the owner puts it "plenty of pots in the cupboard"! Since 2007 only had gentle family cruising on nine occasions. 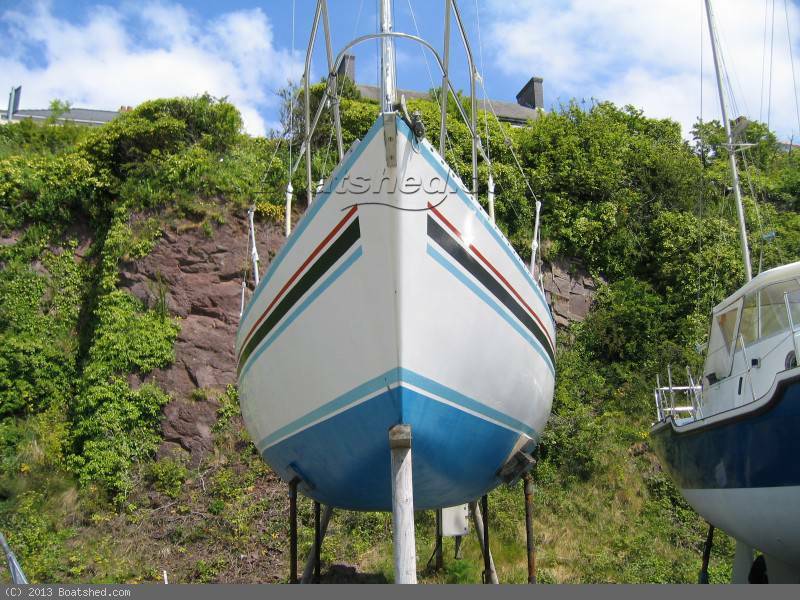 The yacht has always been marina berthed and stored ashore each winter with the rig unstepped and examined. All halyards replaced in 2012, Stowe instruments serviced at manufacturers 2012. Engine fully serviced and new impellor fitted.